Amtrak retired their Pacific Parlour Cars this month – after 23 years in service on Coast Starlight route. This is a combination of videos I took on my one and only Coast Starlight ride in 2015. I had most of my meals in Pacific Parlour Car. Pacific Parlour Car was always busy – so it was difficult getting video that wouldn’t include other passengers. I was traveling from Los Angeles Union Station to Seattle King Street Station. Then back to Chicago on Empire Builder. I rode Southwest Chief from Chicago to LA to catch Coast Starlight. Photo below is NOT mine. It was posted in a forum by passenger getting one last ride inside Pacific Parlour Car. Amtrak will retire the renowned Pacific Parlour Car from the Coast Starlight. The last day of service will be February 2 on Train 14 and February 4 on Train 11. Retiring the Parlour Car is part of Amtrak’s ongoing work to modernize its fleet of equipment. Pacific Parlour Cars are first-class lounges used exclusively on Amtrak Coast Starlight Trains #14 & 11. The cars are used as the exclusive lounge for First Class / Sleeping Car Passengers. 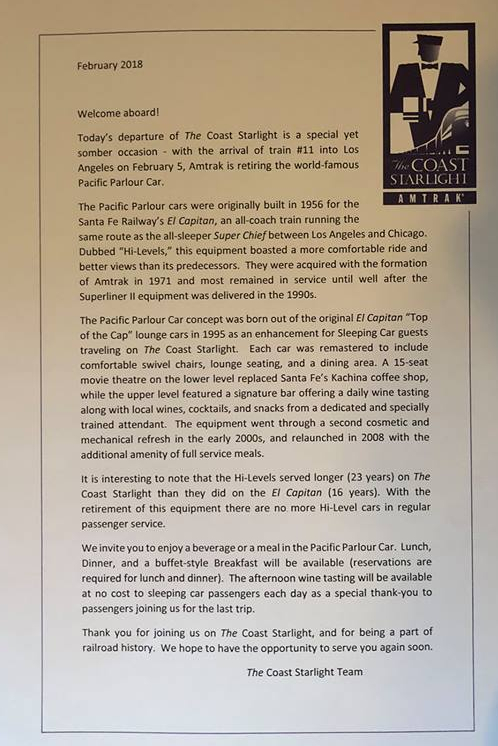 Pacific Parlour Car retirement February 2018? What parts of the Pacific parlour car are 60 years old? The Coast Starlight is a passenger train operated by Amtrak on the West Coast of the United States. It runs from Seattle, Washington, to Los Angeles, California.